Waterford Marquis Crystal Vintage Red & White Wine Glasses Set of 12. This Vintage Red and White Wine Glass Set from Waterford Marquis features 4 red wine aromatic, 4 deep red wine and 4 classic white wine glasses. Red wine glasses feature a large. Bowl designed to allow reds to breath. The deep red wine glasses are designed for lighter reds and the white white glasses are perfect for most any whites. Waterford Marquis Vintage 12 Piece Wine Glass Set. Aromatic red wine glasses set of 4. Deep red wine glasses set of 4. 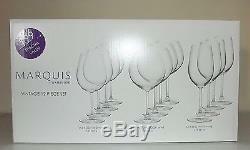 Classic white wine glasses set of 4. Each measures approximately 8.5" to 9.0" tall x 3.5" to 4.0" wide. Ships in an attractive Waterford gift box as shown. Makes a great gift for that special event or holiday! The item "NEW WATERFORD MARQUIS VINTAGE 12 PIECE RED & WHITE WINE GLASS STEMWARE SET" is in sale since Sunday, July 16, 2017. This item is in the category "Home & Garden\Kitchen, Dining & Bar\Glassware". The seller is "onlinequalitybrands" and is located in Charlotte, North Carolina. This item can be shipped to United States, Canada, United Kingdom, Denmark, Romania, Slovakia, Bulgaria, Czech republic, Finland, Hungary, Latvia, Lithuania, Malta, Estonia, Australia, Greece, Portugal, Cyprus, Slovenia, Japan, China, Sweden, South Korea, Indonesia, Taiwan, South africa, Thailand, Belgium, France, Hong Kong, Ireland, Netherlands, Poland, Spain, Italy, Germany, Austria, Israel, Mexico, New Zealand, Philippines, Singapore, Switzerland, Norway, Saudi arabia, Ukraine, United arab emirates, Qatar, Kuwait, Bahrain, Croatia, Malaysia, Brazil, Chile, Colombia, Costa rica, Dominican republic, Panama, Trinidad and tobago, Guatemala, El salvador, Honduras, Jamaica, Antigua and barbuda, Aruba, Belize, Dominica, Grenada, Saint kitts and nevis, Saint lucia, Montserrat, Turks and caicos islands, Barbados, Bangladesh, Bermuda, Brunei darussalam, Bolivia, Ecuador, Egypt, French guiana, Guernsey, Gibraltar, Guadeloupe, Iceland, Jersey, Jordan, Cambodia, Cayman islands, Liechtenstein, Sri lanka, Luxembourg, Monaco, Macao, Martinique, Maldives, Nicaragua, Oman, Peru, Pakistan, Paraguay, Reunion.